Capabilities - Keen Compressed Gas Co.
Our call center is available 24/7. Call 302.594.4545 anytime. We’ll get it to you when you need it! Rest assured that your products are well maintained and working to their fullest capability. Our certified technicians will perform every necessary inspection, from visual to electrical, from frayed cables to calibrations; we’ve got you covered. Our Gas-Chex Program is a series of Plant Inspections and Seminars designed to assist in making your operation safe, cost effective, and efficient. Our trained staff performs a thorough analysis of your gas consumption to determine the proper cylinder size and delivery frequency to ensure the most cost effective process for your job application. From new tank installations to custom modifications, we can service all your piping needs with our expert technicians. Keen offers a variety of tube trailer models to accommodate numerous gas types and pressures. All equipment is built to comply with the regulations of the U.S. Department of Transportation (DOT) with regard to Hazardous Materials Safety, Federal Motor Carrier Safety, and National Highway Traffic Safety. Tube trailers are available in nitrogen, air, breathing air, hydrogen and helium. The MicroBulk delivery vehicle delivers product directly to your stationary liquid tank, replacing your high pressure or liquid cylinders. The fill operation can be completed through a wall mounted fill box connection without interruption to your operation. 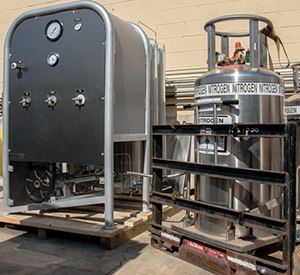 We offer MicroBulk capabilities in oxygen, nitrogen, argon and carbon dioxide. Bulk tanks are engineered for maximum flexibility and minimum installation cost. The piping design makes installation a one-lift process saving time and resources. All tanks are ISO 9001 approved. Great for temporary use and spot needs. Portable bulks are available in oxygen, argon, nitrogen; liquid or gas. The 6000 PSI Pumping Unit is a high pressure pump that allows us to fill Nitrogen and Argon cylinders to high pressures up to 6000 PSI ourselves which results in shorter lead times to our customers. We have CO2 for Beer Meisters! Contact your local branch for availability. Have your bits back in a week or less!